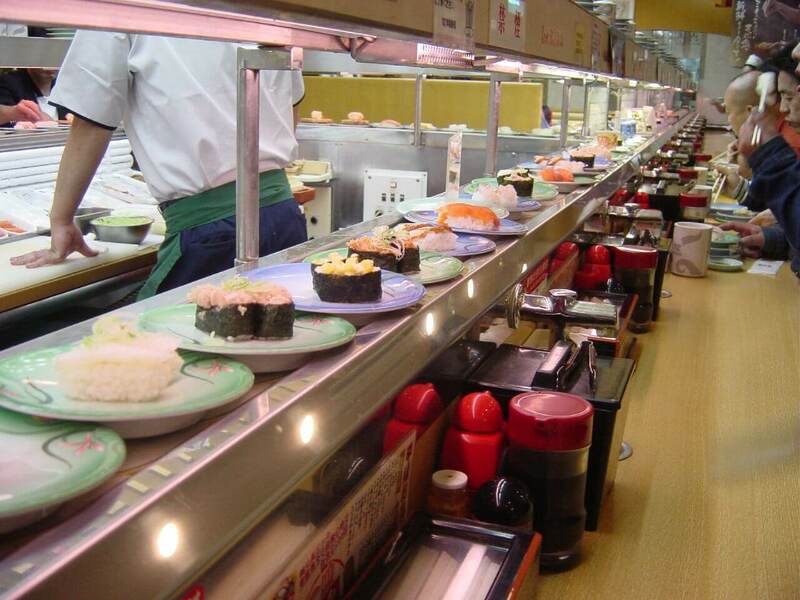 Kaiten sushi, also known as conveyor belt sushi, is extremely popular kind in Japan. But what makes Kaiten sushi different from a standard sushi restaurant? The name says it all, unlike a standard sushi spot where each piece is prepared to order, at kaiten, customers sit next to a rotating conveyor belt and choose from all kinds of sushi that pass by on plates. 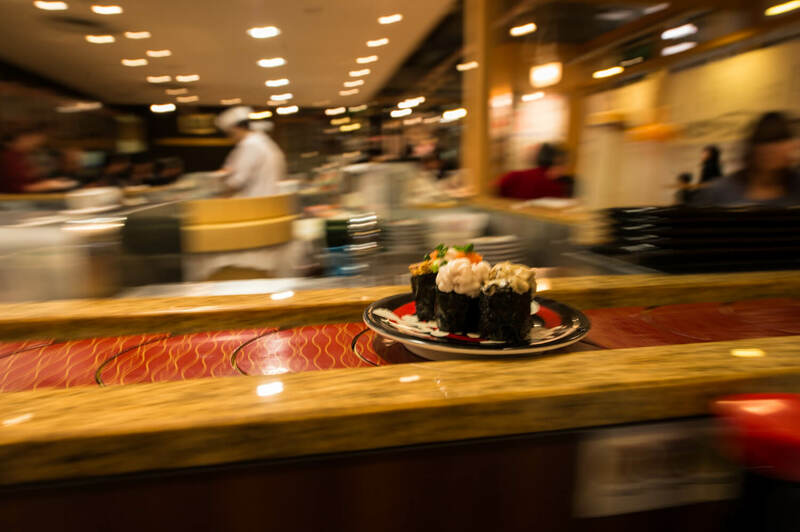 You also will see a table menu so customers can order their favourite sushi, and it will be delivered on conveyor belt or by the wait staff, depending on the restaurant. Even in the category of kaiten sushi, there are many different styles. But they all have one thing in common, a rotating choice of sushi. Fresh choices will constantly be rotating around your table, so once you spot something you like, grab it and it’s yours to eat. One of the differences is how to order something in addition to the sushi on the conveyor belt. In most chain restaurants they have a computerized menu with pictures that you can tap on to order. Other more high end restaurants you may have to call out to the chef to order. Some places even have red bowls that the plates come in which means it is on its way to a certain table and is not for anyone to take. Another difference is the price. Most of the chain restaurants usually have a set price around a $1 a plate. However, at a higher end restaurant you have to be aware of the price, because some sushi can be a lot more expensive than others. When it comes to sushi there are a couple of necessities that every restaurant provides. No sushi meal is complete without soy sauce. Dipping sushi in soy sauce is not only an important part of the tradition, as is adding wasabi, it also enhances the delicate flavours of the fish. 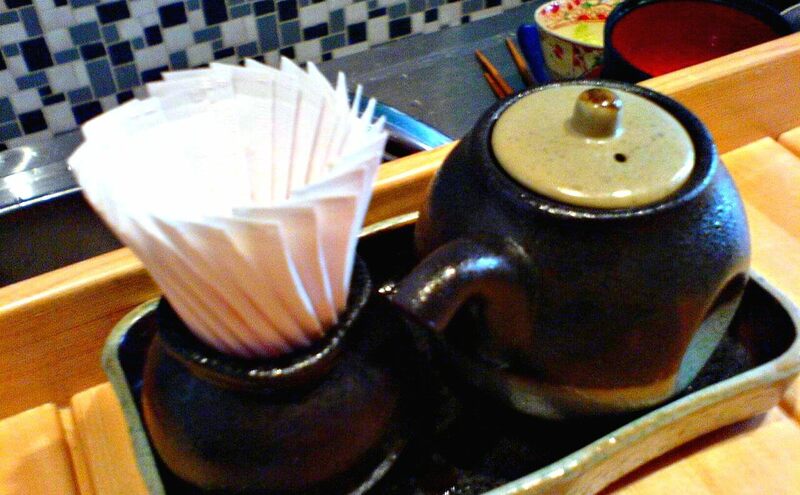 You’ll also find that most kaiten sushi restaurants have a hot water faucet with green tea powder in a small bowl on every table. A lot of people enjoy a cup of green tea while eating their sushi. Another popular thing is young ginger, a type of tsukemono, or Japanese pickle, called “Gari.” The ginger is pickled in sugar and vinegar, and is used to refresh the palate between different kinds of sushi. 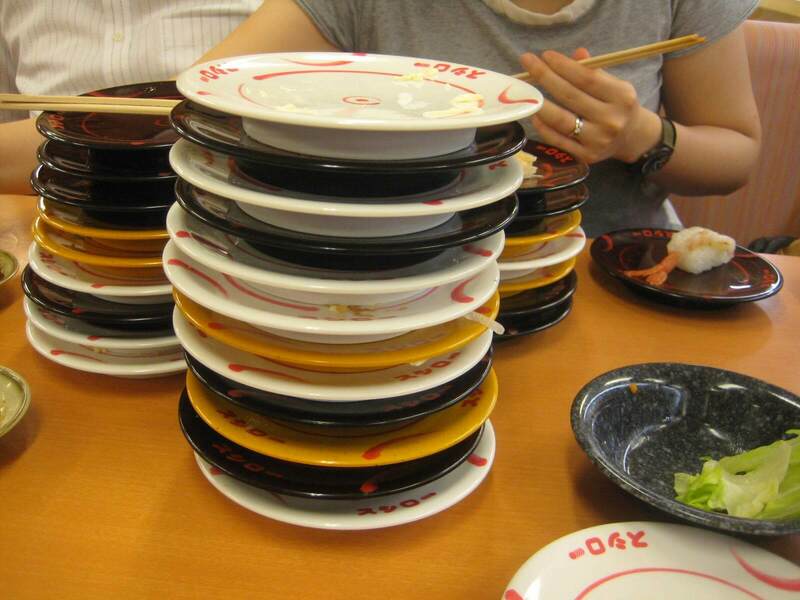 Typically kaiten sushi restaurants charge by the plate. In many places there is a set price for each plate, typically 100 to 200 yen depending on the restaurant. And these sushi are served on a certain coloured plate to show the price. Sometimes, the sushi may be more expensive than the standard price. In that case, they are served on a different coloured plate so that you can clearly tell which types are more expensive, and there won’t be any surprises when it’s time to pay. The prices will be listed on the menu or at the shop entrance to tell you the price of each plate. Recently many kaiten sushi restaurants have installed an RFID chip in the bottom of the plate. They act as a barcode that either scans the plate when it is taken off the conveyor belt or when slid down a slot that calculates the price as the plate is taken back to the kitchen. However the fee is calculated, customers are charged at the end of the meal based on the number of plates and types of plates they selected from the conveyor belt or ordered. No visit to Japan is complete without a visit to the sushi bar. Kaiten sushi is a great way to experience many kinds of sushi, but you also want to make sure that you get the best experience. Knowing what to expect and how to use all of the additional condiments correctly will enhance your experience at any restaurant. For more information and food guides visit Arigato Japan Food Tours.